If you were to peek at my personal emails, you’d see a common word come up: dirt. Making change in your life means that no matter how strong your intention, old fears, habits, and thoughts will rise to the surface as the seeds of change take hold in your innermost being. In other words, when you make changes in your life, the resistance comes up first. This resistance, while not always easy to push through, will ultimately make you stronger. I’ve experienced this myself. When I began a path of improvement, I knew I needed to look forward. Mistakenly, I believed that in order to break the chains of some limiting beliefs, I needed to instantly leave all the fears of the past behind. I discovered, however, that life doesn’t work that way. In order to plant the seeds of spiritual and creative growth, sometimes you have to get dirty. I understand that what you focus on grows, so it may seem counter-intuitive to give any attention to the dirt that comes up. The trick is in recognizing the line where positive focus ends and denial begins. So, what do you do when the dirt comes up? First of all, know that the dirt coming up is not the Universe telling you that you’re on the wrong path. It’s really a way for you to break the bonds of past. Many people give in at this stage, because change is uncomfortable. Don’t give up. Continue to have faith in yourself. Continual Improvement is a great rule of thumb. One of the most valuable points in Esther & Jerry Hick’s book Ask and It is Given, is that you don’t have to force yourself to go from feeling terrible to feeling wonderful. Focus on feeling a little bit better than you did the day before. Slowly, but surely, you’ll take shovels of dirt and toss them out of your way. Listen to your body. If trying to just ignore the dirt plagues your mind, listen to what your body is telling you. If you’re exhausted, go to bed early or take a nap. Get some rest and deal with the dirt when you aren’t exhausted. On the other hand, if your body is restless, get some exercise. Go for a run, or turn on some music and dance around the house. When your body is more refreshed the dirt will seem less muddy. Get some help and lose the story. Sometimes so much dirt surfaces that we begin to feel suffocated. Find a coach, close friend, or therapist help you dig your way out. This person can give you a sacred space to tell your story so that you can begin to let it go. Two things can happen when you lose your story. Sometimes, losing the story will simply bring up emotion. Allow yourself to feel, even if the emotions have negative connotation, like sadness or anger. When you allow yourself to feel, you begin to leave the story and drama behind. Sometimes, losing the story allows you to see it in a different light by giving you the wisdom to re-frame it. Either way, losing your story allows healing and grace into your heart. I won’t lie and tell you that it will be a magic wand and your life will change overnight. Just know that once the dirt surfaces and you push it aside, you’re left with beautiful sprouts of growth. 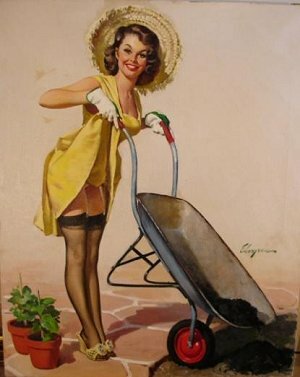 Worth Cultivating is by Gil Elvgren. I love your insightful views on changing things for the better. I have to tell you, you are one of the things that makes my life so much easier. I hope you know how appreciated you are!